Many development practitioners and researchers – including Papua New Guinea - have traditionally regarded the area of communication either as a technical field, or as a means of "delivering messages" and not so much as a tool for enterprise development. Yet, these assumptions are increasingly questioned, as media and communication tools become more accessible to marginalised people, particularly those in micro and small enterprises in rural areas. Rural areas such as Memyamya in Morobe province, Marawaka in Eastern Highlands province, Oksapmin in Sandaun province, Karimui in Chimbu province, Kaintiba in Gulf province, and the list goes on and on. We have to find ways of making Information and Communications Technology (ICT) more relevant and practical for small and medium enterprises (SMEs) in rural areas. Information and Communications Technology can also be used as a powerful weapon in the battle against the scourge of HIV/AIDS that is sweeping the world, including Papua New Guinea, where it now threatens the very livelihood of our people. Examples can be found in uses of participatory video, community radio, print media such as newspapers and magazines, theatre-for-development, music, Internet, community television, and mobile phones and many other various forms of media. These are used all over Papua New Guinea but have not been harnessed as much as a tool for enterprise development. The technology is already there to take Internet to the rural areas of our country, such as Very Short Aperture Terminal (VSATs), but for reasons known to themselves; those in authority seem to be working at a snail’s pace to let our rural areas see the light of ICT. We have to make ICT affordable and accessible for our people or they will continue to remain in the dark. All over this increasingly-globalised world, a massive Information Revolution is taking place as economies use ICT as a passport to what economists call the “New Economy”. uccess in this globalised world is predicated on ICT knowledge and successful knowledge-based economies will be based on the efficient and widespread use of ICT by all sectors within any given country. On the other hand, an increasing number of development projects on promoting mass media for development, such as the International Labour Organisation’s Business Development Services (BDS) Zambia project, are beginning to demonstrate creative and innovative ways of unleashing the power of mass media for accelerating market information services and creating relevant and accessible social dialogue platforms for lobbying for enabling small business environments. Leap-frogging technologies such as mobile Short Messaging Services (SMS) are enabling Micro and Small Enterprises (MSEs) in rural areas to access market information and opportunities in real time. We only need to look within our own country to see the massive improvements in accessing market information and opportunities in real time since the introduction of mobile phone competition through Digicel. There are real life stories of farmers, fishermen, artisans, PMV owners, trade store operators and many more seeing marked improvements in developing markets through their mobile phones. The days of yodelling over the mountaintops to broker barter of goods is long over and our rural areas must also reap the benefits of the massive Information Revolution that is sweeping the globe. Journalists also have a very important role in disseminating information to the bulk of our people in the rural areas rather than the bread-and-butter “shock and horror” stories. * Helping people in small businesses on how to cope with AIDS through relevant and practical information materials such as the HIV and AIDS Handbook for Entrepreneurs in Zambia. The project has produced short videos highlighting the lessons and experiences of the ILO Business Development Services project in Zambia, working with media to facilitate information services for micro and small enterprises in rural markets. Perhaps Papua New Guinea can take a leaf out of Zambia’s book as we ponder the future of ICT in our beloved country. Something to ponder over Christmas/New Year period as we wonder what benefits ICT will bring to us in 2008 and beyond. * For comments and feedback, email malumnalu@yahoo.com or SMS 6849763. If Dr Quinn is television’s “medicine woman”, then Minnie Bate is Papua New Guinea’s answer to her. This quietly-spoken woman from Wedau village in Rabaraba, Milne Bay Province, has become a national icon since her herbal medicine products started winning wide acclaim. She shot to prominence at the PNG-Made Trade Fair in Lae in 2003 when she won awards for “Small Business Encouragement” and “Best New Product” and has since never looked back. The sky is now the limit as she awaits clinical trials and certification of her herbal products by an independent international team of scientific researchers. “The ball is now in their court,” she tells me. “Appropriate license will be issued upon show of evidence of clinical trials. Mrs Bate currently produces herbal soap, hair and scalp care cream, face and body care cream, multi-purpose herbal cream, and multi-purpose herbal oil under her Gemins brand name. All these are produced at her humble backyard. She was enjoying a quite cup of tea on a typically-beautiful Milne Bay afternoon at her home at Goilanai Heights in Alotau when I drove in unexpectedly for a chat. Her products are selling well all over the country, with Popondetta, Lae, Port Moresby and Madang leading the charge. “I have reports from people in high places, especially ladies, who have opted to use our products,” Mrs Bate tells me. “They have found out that our products are better and also cheaper. “They have done away with imported products and are using our products. “Our fastest seller is the soap, sales of which are really picking up. Mrs Bate’s humble beginnings with herbal medicine go back to 1987 when the qualified medical technologist successfully treated a young student who had a serious wart problem for seven years with herbal medicines. “We successfully treated it using the traditional medicine we are now using in our products,” she recalls. “We conducted research into all techniques, products had to be tried out and modified where necessary. “Over the years, we developed a list of all sorts of problems this product could treat like asthma, arthritis and all forms of skin diseases. “In year 2003, we participated in the PNG-Made Trade Fair in Lae and we were recognised by being awarded ‘Small Business Encouragement Award’ and ‘Best New Product’. “That really opened up another chapter where we have to now look seriously at what we can do to get our products recognised by the Health Department. “We were taken to all kinds of workshops by different organisations, including one on traditional medicine. “This was more or less the Government recognising what we were doing. Mrs Bate was trained as a medical technologist at the then Papuan Medical College in 1972 and 1973, worked for eight years with the Health Department, and then went back to the same school from 1980 to 1983 where she completed her Diploma in Medical Technology. She then joined the Department of Agriculture and Livestock and taught basic science, nutrition and health to diploma students at the Vudal Agricultural College outside Rabaul from 1986 to 1990. She then moved over to the Popondetta Agricultural College from 1990 to 1996 “when I stopped because of this thing (herbal medicine)”. “While I was teaching,” Mrs Bate confesses, “I was also doing my personal research. “When I finished from the public service, the product was already there and just had to be developed. “A company was established in 1993 called Pomins Ltd.
“That happened during my long leave. “While working, I was selling and promoting my products. “Most of my promotion happened in Oro Province. Mrs Bate’s big break came in 1995 when she attended a workshop in Fiji on traditional medicine. “From that workshop,” she remembers, “one thing that really hit me was the income that could be generated from traditional medicine, so we started producing multi-purpose herbal cream and multi-purpose herbal oil. In 2002, she attended further workshops in Vanuatu and Fiji, where she learned about how seaweed could be blended into her products. “I successfully produced seaweed-based products blended with herbs, mainly for face and baby care creams, as well as soap, which are now in high demand. Mrs Bate, despite being pressed, would not reveal the ingredients or recipes for her products – which are a closely guarded trade secret. Everything is produced in her backyard with the help of a very-supportive husband from Bubuleta village on the East Cape of Milne Bay, as well as her four grown-up sons. “I depend on my family for support,” Mrs Bate says. “From the very beginning, they understood that I was trying to develop traditional medicine commercially. “I have a very understanding family which has stood behind me in very tough times. “Once I get my license (when the products are certified), I can do business in a big way. Mrs Bate can be contacted on telephone/facsimile (675) 6410699. Isurava, which Australian Prime Minister John Howard visited in August 2002, was the site of a significant World War 11 battle. Few Australians or Papua New Guineans seem to know the tremendous story of courage and tenacity at Isurava, but it is hoped that some will take the time to learn about it, especially after the Australian Prime Minister’s visit. Mr Howard’s visit was even more momentous in that the 60th anniversary of this significant World War II battle critical to keeping Australia free from invasion fell on August 29, 2002. The four-day Battle of Isurava along the Kokoda Trail in 1942 would not, in isolation, be regarded as a victory for Australian forces. It was however vital to Australia’s security, because it bought Australian and American forces the time they needed to fortify Port Moresby and ultimately stem the Japanese invasion of Papua. By the time of the Battle of Isurava, Darwin had already been bombed and Japanese midget submarines had penetrated Sydney Harbour. Australian and Papua New Guinean servicemen fighting along Kokoda were thelast line of defence against enemy invasion. Those veterans who took part in this battle should be very proud of their service. It has already become an important part of the heritage of all Australians and deserves to be honored likewise by Papua New Guineans. During the period from 27-30 August 1942, under almost constant attack, soldiers of the 39th Australian Militia Battalion and the 2/14th Battalion, Second Australian Imperial Force, with the help of the 2/16th Battalion and the 53rd Battalions, held back the advancing Japanese at Isurava. By late August 1942, the Japanese South Seas Force had fought its way into the Owen Stanley Range. Four companies of the Australian 39th Battalion were drawn up in a defensive perimeter of Isurava village. With support from the 2/14th and 2/16th battalions, 21st Brigade, Second Australian Imperial Force, their orders were to push the Japanese back beyond Kokoda. On the afternoon of August 27, Japanese forces struck at the 39th Battalion, and only a determined Australian counter-attack forced back the enemy that day. increased in intensity on 29 August. At noon an enemy breakthrough threatened the whole left of the Australian position. As a desperate counter attack developed, Private Bruce Kingsbury of the 2/14th Battalion rushed forward, through terrific Japanese machine gun fire, firing his Bren gun from the hip. Before he fell to a sniper's bullet, Kingsbury cleared a way for his comrades, who were then able to restore the position. Private Kingsbury’s bravery was recognised by the award of the first Victoria Cross in the fighting in Papua New Guinea. Indeed, Kingsbury’s VC was the first VC ever won on Australian territory, as Papua then was. To avoid the situation becoming more desperate it was essential to regain immediately lost ground on the right flank. Private Kingsbury, who was one of the few survivors of a Platoon which had been overrun and severely cut about by the enemy, immediately volunteered to join a different platoon which had been ordered to counter- attack. He rushed forward firing the Bren gun from his hip through terrific machine-gun fire and succeeded in clearing a path through the enemy. Continuing to sweep enemy positions with his fire and inflicting an extremely high number of casualties on them, Private Kingsbury was then seen to fall to the ground shot dead by the bullet from a sniper hiding in the wood. Private Kingsbury displayed a complete disregard for his own safety. His initiative and superb courage made possible the recapture of a position which undoubtedly saved Battalion Headquarters, as well as causing heavy casualties amongst the enemy. His coolness, determination and devotion to duty in the face of great odds was an inspiration to his comrades. The fighting spirit of the militia men of the 39th Battalion at Isurava also earned for them the admiration of the battle-hardened soldiers of the Second AIF. Two platoons of the 39th Battalion had been cut off along the Kokoda Track. On August 29, as these exhausted men struggled into Alola village, they heard that their mates were under tremendous pressure from enemy attack at Isurava. Immediately they turned round and headed off to help them. However, by the evening of August 29, despite their determined defence of the village, the Australian position at Isurava had become untenable. What followed was the famous fighting withdrawal down the Kokoda Track during September 1942, which ended with the Australian dig-in on Imita Ridge on September 17, 1942. From Imita, there was no further retreat. On September 28, the Japanese began their withdrawal back across the Owen Stanleys along the Kokoda Track, having come within sight of the sea and the lights of Port Moresby on Ioribaiwa Ridge opposite Imita. Whatever the estimate among historians of the immediate and medium term gains and losses for the Australians at Isurava, the courage and determination of those involved was in the finest traditions of Australian soldiers in battle. In James Seeto’s Lae office is a larged framed photograph of his father Seeto Kui, his mother, as well as places precious to him such as Salamaua, Wau and Lae. Theirs is a story of Salamaua, Wau, Lae, the horrors of war, and starting a company with only 100 Australia Pounds in war-devastated Lae into what is now a thriving business. Seeto Kui was the founder of the current Seeto Kui Organisation, now a substantial multi-million Kina business with nearly 1000 employees, distributing throughout Papua New Guinea in the grocery, variety, supermarket, plumbing supplies, hardware, construction, and stationery and office supplies market. He traveled from Canton, China, by ship and arrived in Rabaul, East New Britain, in 1914, at the tender age of 13 years to work as a tailor. Some years later, he was sent to the then-thriving Salamaua, Morobe, to work as a trade store manager, where he earned himself sufficient money to go back to China in the early 1930s, where he married and returned to continue work and traveling back and forth to China. James Seeto, Seeto Kui’s first son, first arrived at Salamaua with his mother and sister, Joyce, in 1938, to be with their father. Unfortunately, his mother died some time after and was buried in the local cemetery. “My memories of Salamaua are very limited,” Mr Seeto tells me. “I went there when I was two or three years old. The family then moved to the gold rush town of Wau from Salamaua, where Seeto Kui opened his own trade store. “Wau has always had a very cool climate,” Mr Seeto remembers. “I would run around, playing. In early 1942, World War 11 came to Wau with Japanese aircraft bombing the area. “All I can remember about Wau is the bombing. Men women and children were to be evacuated by two aircraft but unfortunately, one of the aircraft was damaged when a vehicle accidentally struck its landing wheels, disabling it and leaving only one aircraft to take the women and children. The men, including Seeto Kui, were forced to escape the invading Japanese by trekking the whole way from Wau to Port Moresby over the infamous Bulldog Trail. The family was reunited in Port Moresby and then evacuated by the famous ship “Macdhui” MV to Sydney, Australia, where they stayed in a refugee camp until the war ended. During April of 1948, the family returned to Lae by Qantas DC3 aircraft, which then took two days to arrive, with an overnight stop at the Queens Hotel, Townsville, Australia. Seeto Kui arrived in Lae with only 100 Australian Pounds in his pocket from war compensation, and with this, he built his own trade store in the Lae Chinatown area. He was assisted in building the store by fellow Chinese residents, displaying the community spirit that was possible in those days. Young James Seeto commenced boarding school in Sydney during early 1950 but was recalled back to Lae in 1952 due to his father’s illness and to take over the running of the family trade store. He has been involved in the running of the business ever since. Seeto Kui passed away on March 18, 1972, and was buried in Lae. James Seeto has been active in the Lae community over the years including participation in fundraising committees, social clubs and organisations, local government councils and government statutory institutions. Lae City Council – Elected, as board member of 14 years, the various positions held from times as Executive Finance Chairman, Building Board Chairman, and Vice President. · Disaster appeals created as required from time to time and supported by the Seeto Kui Group of Companies. His efforts and contribution to the community have been officially recognised with the award of an MBE in 1980, and more recently, a CSM and the PNG Anniversary Medal during 2006. The Seeto Kui business was further developed extensively with the assistance of James’ brothers, Robert, Ronald and Danny, and included the establishment of further wholesale and distribution outlets in Lae, dealing in trade store goods, general merchandise and supermarket lines. Additional branches were subsequently established in Port Moresby, Mount Hagen and Goroka. The Mt Hagen and Goroka outlets have since been sold, but the business with the Highlands has in fact grown since then through trading with clients based in those areas, serviced by traveling representatives, who also travel extensively throughout the country to service customers. James Seeto and the Seeto Kui Organisation has been involved in Mainland Plumbing Supplies (N.G.) Limited, based in Lae, since its incorporation in 1972, in both a managerial and minor equity capacity. The majority shares in the company were purchased by the Seeto Kui organisation during 1989 and a branch has since been opened in Port Moresby. Ardrossan Investments Pty Ltd, trading under the name of Bowmans – Lae, was purchased in 1991 and this hardware and construction business has further grown with diversification and the development of the stationery and office supplies division. The business that was started by Seeto Kui with 100 Pounds nearly 70 years ago is now a substantial multi-million Kina business with nearly 1000 employees, distributing throughout Papua New Guinea in the grocery, variety, supermarket, plumbing supplies, hardware, construction, and stationery and office supplies market. The Seeto Kui Organisation holds an enviable portfolio of local and overseas agencies including many internationally-recognised brands and the component of this business continues to grow. The development of training facilities within the organisation has been highly successful with a large number of in-house training programmes on offer. This is considered an important investment in, not only the development of the workforce, but also in the long-term success of the business. The Seeto family has traditionally preferred to reinvest in growing the business and creating employment within Papua New Guinea, rather than transfer profits offshore. The establishment of the Food Mart supermarket in Lae is a recent example of this policy and represented a huge investment in the local community. The Seeto Kui Group of Companies underwent a company amalgamation during early 2005 and the organisation now trades as Seeto Kui (Holdings) Limited. James Seeto and his family have lived and worked in Papua New Guinea for four generations and their shared vision is to continue to invest and assist in the development of Papua New Guinea for now and the future. “Seeto Kui, from day one up until now, has never looked back,” Mr Seeto says. “We always try to look forward. “We keep going into trade that is compatible with our business. Now aged 71, Mr Seeto has not retired, and remains active in running the company. He also has a lot of time for wife Anna, children Belinda, Anthony, and Raymond, as well as his six grandchildren. “I’m in the process of activating the next generation to take over,” he says with a smile. “I know that I will not last forever. Mr Seeto makes no secret that Papua New Guinea, and particularly Lae, is in his blood, and particularly stresses that Seeto Kui is not a “fly by night company” and is here for the long haul. He remembers the country’s Independence in 1975 when a lot of paranoid expatriates moved out of the country. “A lot of people moved out of Lae because they feared Independence would cause chaos and problems,” Mr Seeto says frankly. “All I can say is that the company has confidence in Papua New Guinea. “We’d like to think that we help the country by providing employment. “Papua New Guinea has been good to us and we hope that we, in turn, can help Papua New Guinea. “If I wasn’t confident in the country, I would not be here now. His name is echoed over and over again. To study to learn and to write. In reality he is the soul of the nation. I am always conscious of Kumalau as that man in attendance at each gathering of writers, artists, musicians, dancers and choreographers. He is the one seated at the gate and next to the garamut announcing the arrival of PNG scribes and intellectuals. The feast is at its peak. People of all walks of life come along to the gathering and Kumalau's poetry in correlative accompaniment of the garamut beat announces the presence of all. That is how I picture those colorful days of 1970, 1971, 1972 and beyond. The poet indeed, as the dawn singer would, proclaimed the arrival of PNG Literature. At that time names such as Vincent Eri, Albert Maori Kiki, Ignatius Kilage, Michael Somare and others came into prominence through the written word. These were followed by John Kasaipwalova, Leo Hannett, John Waiko, Rabbie Namaliu, John Kadiba, Percy Chatterton, August Kituai, Wauru Degoba, Bedus Mapun, John Kaniku, Arthur Jawaodimbari, Jack Lahui, John Kolia, Bonita Jill Tiwekuri, Sally Anne Bagita, Josephine Abaijah, and Alice Wedega et al. Some years later we would hear other names such as Nora Vagi Brash, Loujaya Dunar, Toby Kagl, Michel Mel, Steven Edmund Winduo, Regis Stella, Carol Kidu, Moses Maladina and, of course, the list braces to build on. But the poet has accomplished what he had set out to do. It was to put on record Papua New Guinea's true sentiment of what being a Papua New Guinean really means. How we feel about the weather, the environment, the topography that surrounds, the rivers we swim in and the seas that bring in a wealth of food and pleasure. How we view ourselves as contemporary citizens of our country. Kumalau said it all through his poetry, being one of the first of Papua New Guinea's poets to do so. His work is studied at universities everywhere, among them the famous poem "The Bush Kanaka Speaks", which often poses as one of the country's most significant commentaries ever made in its bid to gain political independence from Australia. His other works have been translated into many languages, and have also been represented in the pages of some of the most prestigious publications in the world. Our MPs should realise that computers take centre stage in the massive Information Revolution currently sweeping the globe. In the near future, as wireless networking (Wifi) comes into play in Papua New Guinea, as in other countries, radio and television may become obsolete. The newspaper you are reading may also follow the same trend because you don’t need to buy a newspaper when you can read it online. Radio has played a pivotal role in our development, however, times are changing. Internet radio is the latest technological innovation in radio broadcasting since the business began in the early 1920s. Internet radio has been around since the late 1990s. Traditional radio broadcasters have used the Internet to simulcast their programming. But, Internet radio is undergoing a revolution that will expand its reach from your desktop computer to access broadcasts anywhere, anytime - and expand its programming from traditional broadcasters to individuals, organisations and government. Radio broadcasting began in the early ‘20s, but it wasn’t until the introduction of the transistor radio in 1954 that radio became available in mobile situations. Internet radio is in much the same place. Until the 21st century, the only way to obtain radio broadcasts over the Internet was through your PC. That will soon change, as wireless connectivity will feed Internet broadcasts to car radios, PDAs and cell phones. The next generation of wireless devices will greatly expand the reach and convenience of Internet radio. The available broadcast spectrum (you might get a couple of dozen radio stations locally). Internet radio has no geographic limitations, so a broadcaster in Wabag, Enga Province, can be heard in Japan on the Internet. The potential for Internet radio is as vast as cyberspace itself (for example, Internet radio network Live365 offers more than 30,000 Internet radio broadcasts). In comparison to traditional radio, Internet radio is not limited to audio. An Internet radio broadcast can be accompanied by photos or graphics, text and links, as well as interactivity, such as message boards and chat rooms. This advancement allows a listener to do more than listen. The relationship between advertisers and consumers becomes more interactive and intimate on Internet radio broadcasts. This expanded media capability could also be used in other ways. For example, with Internet radio, you could conduct training or education and provide links to documents and payment options. You could also have interactivity with the trainer or educator and other information on the Internet radio broadcast site. Internet radio programming offers a wide spectrum of broadcast genres, particularly in music. Broadcast radio is increasingly controlled by smaller numbers of media conglomerates. In some ways, this has led to more mainstreaming of the programming on broadcast radio, as stations often try to reach the largest possible audience in order to charge the highest possible rates to advertisers. Internet radio, on the other hand, offers the opportunity to expand the types of available programming. The cost of getting “on the air” is less for an Internet broadcaster, and Internet radio can appeal to “micro-communities” of listeners focused on special music or interests. What do you need to set up an Internet radio station? The audio enters the Internet broadcaster’s encoding computer through a sound card. The encoder system translates the audio from the sound card into streaming format. The encoder samples the incoming audio and compresses the information so it can be sent over the Internet. The compressed audio is sent to the server, which has a high bandwidth connection to the Internet. The server sends the audio data stream over the Internet to the player software or plug-in on the listener’s computer. The plug-in translates the audio data stream from the server and translates it into the sound heard by the listener. There are two ways to deliver audio over the Internet: downloads or streaming media. In downloads, an audio file is stored on the user’s computer. Compressed formats like MP3 are the most popular form of audio downloads, but any type of audio file can be delivered through a Web or FTP site. Streaming audio is not stored, but only played. It is a continuous broadcast that works through three software packages: the encoder, the server and the player. The encoder converts audio content into a streaming format, the server makes it available over the Internet and the player retrieves the content. For a live broadcast, the encoder and streamer work together in real-time. An audio feed runs to the sound card of a computer running the encoder software at the broadcast location and the stream is uploaded to the streaming server. Since that requires a large amount of computing resources, the streaming server must be a dedicated server. •For feedback and comments, email malumnalu@yahoo.com or SMS 6849763/72580278. 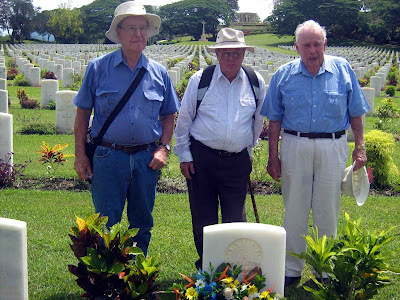 It was truly a touching and very sad moment as three Australian brothers paid tribute to an elder brother they lost 65 years ago on the bloody battlefields of Buna, Oro Province, on December 2, 1942. They cried, hugged each other, and talked about the love they had for William Dennis Blake, who was barely out of his teens when killed by a Japanese sniper in Buna during the dark days of World War 11. All of us there, including me, had tears in our eyes as we watched this truly-moving ceremony. Private William Dennis Blake was only 20 years of age when he made the supreme sacrifice for peace whilst a member of the 2/6 Independent Company of the Australian Infantry Forces. He left behind a heartbroken young family who have never let got of their memories. His three surviving brothers Robert (84), Roger (80), and Maurice 77, together with nephew Bill (53), made the emotional pilgrimage to his graveyard at Bomana War Cemetary last Sunday, December 2, the 65th anniversary of his death. Earlier, last Saturday, they flew over their brother’s battlefields of Buna and Gona. They said a prayer for peace, read a message from their family members, and then laid a wreath on the grave of their brother. “It’s a very sad and emotional time,” Robert said after the poignant ceremony. “He (William) was born in Waikerie, South Australia. “We left home when he was 14 and I was 13. The winds of war were blowing across the world during those days of the late 1930’s and early 1940’s and both brothers joined the Australian army – William with the Infantry and Robert with the Navy. “When we joined the army, he (William) had a horse,” Robert recalled. “He rode the horse 120 miles to join up (with the army). “That was quite a thing to do, to ride a horse for 120 miles. “He trained in Victoria and Townsville before being sent to New Guinea. “He served on the Kokoda Track and then Oro Bay. Robert, meantime, joined the Royal Australian Navy and served on the HMAS Corvette in the waters of New Guinea and Borneo. He was earlier on the HMAS Adelaide when news came of the death of his beloved elder brother. “I was in Melbourne on the HMAS Adelaide when the news came,” Robert remembers. “You break down, that’s all, it’s really, really sad. William was survived by his parents, four brothers and a sister. This was the prayer read last Sunday: “Almighty God, our Heavenly Father, we remember with thanks William who made the supreme sacrifice for us in time of war. “We pray that the offering of his life may not have been in vain. “May your Grace enable us this day to dedicate ourselves to the cause of justice, freedom and peace; and give us the wisdom and strength to build a better world. “May your strength and peace be ours as we mourn again the loss of William, and may your peace surround us this day of remembrance. And this, the message from his many nieces and nephews, for their perennially-young uncle: “Although we never had the privilege and honour to have met you, we feel we have come to know you through your letters to the family. “What a tremendous uncle you would have been to us. “Today, we feel your spirit would be happy that your three brothers have come to visit your final resting place. “Uncle Bill, your legacy will never be forgotten. Welcome to Russell Soaba’s world. He is the portrait of the odd man out, an individual, and a great thinker. 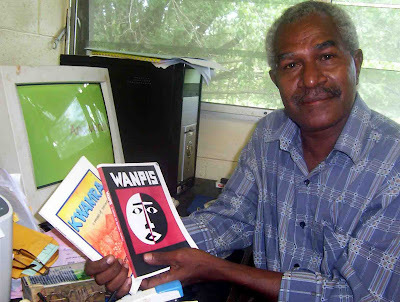 Russell Soaba is also one of he greatest, if not the greatest, writer in Papua New Guinea. His works, particularly novels Maiba and Wanpis, are studied in universities all over the world by students of literature and philosophy. Followers of the existentialism philosophy all over the world dote on the writings of Russell Soaba. It is, however, a paradox that Russell Soaba is not even recognised in his own country Papua New Guinea for his great contribution to the country’s literature. Only recently, he was awarded a Papua New Guinea independence medal, something that was supposed to have been given in 2000 but deferred because of the troubles on the University of PNG campus. For this he is grateful, and adds that it is something for all the writers of Papua New Guinea, both young and old. The 56-year-old, who speaks in parables, was born the “day after the 4th of July in 1950”. “I think it’s about time,” he tells me in a rare interview. “The only writer we have honoured, but in that matter for some other reason, is Sir Paulias Matane, with Michael Somare, Rabbie Namaliu, these people. “But they are being honoured for some other reason than writing, and that’s the saddest thing. “What these men must realise is that we deserve the same type of recognition as they do, even though they may think that the work they do differs from us. “If you look at it closely, it all boils down to one important aspect of our society, and that is ‘communal service’. “Every other journalist or scribe does exactly the same thing. “So we must all be recognised on an equal footing. “Ultimately, there is no denying that we all serve our community with the same amount of determination, commitment and dedication. “It always comes back to what I always complain about. “A writer is an unofficial ombudsman of the country. “That means duties more in the area of human relationship. “By that, I mean that as an ombudsman, or as an unofficial ombudsman, he does not set out to correct his neighbour, rather, what he is doing as that type of ombudsman, is lightly tapping a colleague on the shoulder and saying ‘listen brother, let’s no overdo this. It might have some negative results for both of us’. “A writer is an ombudsman in that sense. “He’s likely to correct a brother, who is likely to make a serious mistake. Soaba then speaks three parables to me - that of the girl who does not serve him at Big Rooster, Asian efficiency as compared to his owned beloved country, and Alotau laziness – to point out the very serious attitude problem Papua New Guinea has. “We as Papua New Guineans have this very bad attitude,” he says. “If we change these bad attitudes, how much more easier, better and happier it would be? “Looking at the way a writer looks at the society he lives in, and how he feels about certain things, why are things suddenly so wrong? “We can’t blame the politicians too much. “He is merely behaving like why is he a politician. “The real wrong lies within out attitudes. “I could write a long, long book about these bad attitudes we have as Papua New Guineans. “You’re seeing the writer passing over as an unofficial ombudsman; a friend who cares to give some good advice because he cares about you. “I see all of our writers as unofficial ombudsman of the society we live in. “It comes back to the age-old slogan that ‘the pen is mightier than the sword’. “Its might is seen when there’s so much of small detail faithfully recorded without any grudges, put with a great amount of passionate zeal. Soaba, Australian-educated high school student from Cape Vogel in the Milne Bay Province, talks fondly about his schooling days including the visit of Prince Charles to Martyrs Memorial High School in 1967. “We were able to push him and given him a nudge. In 1968 and 1969, this precociously-talented Papua New Guinean was awarded an Anglican Church Scholarship to Australia to complete 11 and 12 at Baldwyn High School in Melbourne. “Around that time I read in the Melbourne Age about 10,000 Years in a Lifetime (by Albert Maori Kiki) and I became excited about a Papua New Guinean writing a book,” Soaba tells me with emotion. “And then I read I bit in Melbourne about Uli Bier (literature lecturer) influencing on (UPNG) campus. “Even when I qualified to enter any Australian university then, I discovered that it would be far more exciting if I came back to UPNG. “I was able to terminate the church scholarship, come back, and apply for government scholarship at the university. “In 1970, I became so excited meeting Leo Hannett, Uli Bier, Arthur Jawodimbari, Rabbie Namaliu, a certain angry student politician called John Kasaipwalova, and a certain angry young man from outside called Michael Somare. “These people I felt thrilled in meeting in person in the years 1970 and 1971. “And of course, the personality who really thrilled me most was Vincent Eri, author of the first Papua New Guinean novel called The Crocodile. “There was another quite personality I felt proud to meet: that was the poet Kumulau Tawali, and also another poet called Jack Lahui. “In a way, I felt proud to be among this famous group of PNG writers. “Since then I attended Uli Bier’s creative writing classes. “He exercised that same sort of influence he had in Nigeria. “His presence merely motivated PNG writers to emerge into worldwide recognition like Vincent Eri, Albert Maori Kiki, and the plays of Leo Hannett, Arthur Jawodimbari and John Kasaipwalova. “Writing flourished at that time. “Since then I have enjoyed the privilege of being among these famous people. “Since then, of course, I consider myself as a writer. Soaba’s greatest works are Wanpis (1977) and Maiba 1986 – studied all over the world - and poem anthologies Naked Thoughts (1978 and Kwamra (2000), among various others. “Since then, I sort of became lazy, not really lazy, but too much of teaching commitments,” he laughs. “As such, much of the writing that I do has dwindled. The government, Soaba feels, must give more support to writers. “What the government of Papua New Guinea must do is institutionalise a writers’ and artists’ endowment fund, a grant programme,” he tells me. “The government of PNG has no choice but do what is honourable by creating a grant programme for our writers and artists throughout the country. “There is a place where this can be housed. “This is the National Cultural Commission. “The National Cultural Commission does have a Literature Board. “What the government needs to do is use the literature board as the clearing house for this grant programme. “The Somare government must recognise that, along with any government that comes along into power. “It’s only honourable that they entertain it, support it in the best way possible. “Consider the percentage of tax that government solicits out from business houses, companies, corporations. “What I would ask for is 2 per cent tax money to go towards the writers’ grant scheme. “The government can enjoy its 98 per cent. I ask Soaba about how he describes in writing, which I – personally – would describe as way beyond its time. “It addresses the individual man than the community as a whole. “This is because I believe that this is where things start. “Everything starts off with an individual and progresses to two people, on three, and then the community. “Also, the characters that I create are these Papua New Guinean individuals. “So really, if I concentrate on an individual, that doesn’t mean that I am working alone. “In fact I’m speaking for the whole population. “Each of these individuals gets born, cries to be heard, becomes an individual, and becomes a Papua New Guineans man or woman. So how this he feel about his books being studied all over the world by students of literature and philosophy? “The books themselves are studied not only in literature out there, but also in philosophy, social work and cultural studies. “There are a great number of universities throughout the world who use the novel Maiba as a textbook. “There is a women’s university in the USA who use the book Maiba every now and then as a textbook. “I recall how pleased I felt with that school at one time. “The principal wrote to me about the book, and that they were happy to teach the book at the school, they regarded me as an up-and-coming African woman writer. “I replied and said ‘thank you’,” Soaba laughs wickedly. “I have had an offer from an Italian publisher who wants to translate Maiba and Wanpis into Italian. “I also have recently selected a biographer to write my biographer. “The other thing I would like to add is that I want to encourage our young writers of today to write seriously about us as Papua New Guineans. Aaron Hayes first came to Papua New Guinea in 1997 to work with the Education Department as a guidance officer. Part of his job involved providing careers counselling to students in the secondary schools, and helping them prepare for life after Grade 10 or 12. Hayes wrote a book called the PNG School Leaver's Handbook which is still available in schools. “In the book I tried to present all kinds of ideas for young people to be self-employed in the village instead of hanging around unemployed in the towns,” he says. “While researching village tourism for the Handbook I found out that hardly any tour companies were offering village-based tourism products to overseas travel agents and tour wholesalers. “When I enquired, tour operators said that village tourism was unreliable, difficult to book and difficult to sell. Hayes took the bull by the horn, and when he finished his contract with the Education Department at the end of 2002, he decided to stay in Papua New Guinea and start up two companies. One is PNG Development Services which helps design community projects and business ventures for people in rural areas and the other company is Ecotourism Melanesia. Ecotourism Melanesia is an inbound tour company which specialises in sending tourists into the rural areas of PNG. “My company has a policy that every one of our tours must include at least one night in a village guest house or rural lodge, no matter ‘how high’ the tourist is,” Hayes says. “We offer tours all over PNG and also do Kokoda Trail trekking. “My main aim was to prove that village tourism could be successfully packaged and sold through travel agents all over the world and I have already proven this because my company is growing after four years. In 2004, Hayes and a few like-minded people set up a non-profit organisation to help village people get involved in ecotourism and to help market PNG village guest houses overseas. This organisation is the Community-Based Tourism Foundation of PNG Inc. The organisation plans to run proper training for village guest house operators with training books and videos in Tok Pisin, and have its own website with all the village guest houses in PNG listed on the website and provide a booking service for all the guest houses, and market village tourism on the internet. “We printed an awareness pamphlet about village tourism and distributed the pamphlet through provincial tourism officers and we have been flooded with hundreds and hundreds of letters from village people all over the country requesting help and advice on village-based tourism,” Hayes says. “What an opportunity to help the rural people! “But the CBTF only ran well for a year with funding from the Tourism Promotion Authority and since then we have been unable to get any more funding so the Community-Based Tourism Foundation is currently inactive. “Letters continue to arrive every week asking for help but we are unable to respond at the moment. “This was the only organisation dedicated to supporting the growth of the village guest house industry in PNG so it is sad that this organisation cannot be better supported. Ecotourism involves visitors coming to interact with the natural and cultural attractions of a place rather than visiting man-made attractions like resorts, fun parks, museums, and so forth. In some countries ecotourism is also taken to mean tourism that has very little impact on the natural environment, even to the extent of implementing measures like composting toilets, raised walkways and solar power to make ecotourism facilities environmentally friendly. Picture above shows ecotourists from Lithuania visiting a village near Woitape in Central Province. Australian Aaron Hayes, who runs Ecotourism Melanesia, a Port Moresby-based inbound tour company which specialises in sending tourists into the rural areas of Papua New Guinea, is one those who takes a special interest. “Here in PNG, we use the word ‘ecotourism’ more generally to mean ‘nature and culture based tourism’,” Hayes expounds. “Other catchphrases these days are ‘responsible tourism’ and ‘community-based tourism’. “Responsible tourism denotes tourism that cares for both the environment and the local people by ensuring that the tourism activity treads softly on the environment and also has decent benefits for local communities. “These days many tourists browsing holiday pamphlets and websites tend to ask tour operators for information about how their tours benefit local communities. “Community-based tourism involves tourism ventures that are actually owned and operated by people who live in the community area where the tourism activity takes place. “For example village guest houses and village tours. “Over at Tufi the Dive Resort takes groups of tourists to see a demonstration of sago-making in a local village beginning with cutting the sago stands and ending with cooking and eating the sago in somebody's home and this is an excellent example of community-based tourism. “Some community-based tourism ventures like village guest houses are run by individuals and families whereas larger ventures like a Wildlife Management Area or village singsing experience might involve the whole village. “Community-based tourism enterprises owned by whole villages are generally not sustainable here in PNG because there are too many hands out for a share and the income from the enterprise is generally too low to satisfy every shareholder's expectations. “Many politicians and donors have given money to kick-start village-based lodges and eco-resorts but how many of them are still operating today? “Generally they collapse due to poor management, lack of marketing, and disputes which arise when shareholders are not satisfied with the amount of money they are receiving compared to the effort they are giving. “One sad case is the Kamiali Guest House in Morobe which is owned by the Lababia Village community and situated in a magnificent Wildlife Management Area. “This place could be the biggest ecotourism attraction in PNG but it is poorly marketed and poorly managed. These days many tourism destinations in our region have focused on mass tourism that caters for the Australian holiday market, what we call "beach-and-palm-tree tourism". These tourists don't mind if they go to Fiji or Bali, whichever one is cheaper, as long as there's a beach with palm trees and a nice resort with a swimming pool. If you look at the pamphlets and advertisements put out by tourism operators in Malaysia, Bali, Fiji, New Caledonia, Vanuatu, Cook Islands, Samoa and even the Whitsunday Islands in Queensland, you'll see that they are all advertising the same thing: a resort holiday by the beach where tourists can relax and enjoy themselves. “If PNG tries to compete in the beach-and-palm-tree mass tourism market we are doomed,” Hayes warns. “PNG doesn't have enough postcard-perfect white beaches in accessible locations where resorts can be built, and even if we did there are too many turn-offs in PNG that resort developers will shy away from including the urban crime problem, a generally violent society nationwide, health risks like malaria and TB and the mess created by betel nut everywhere. “If beach-and-palm tree tourists have a choice between a resort in PNG and a resort in Vanuatu or Queensland, they won't pick PNG because in many ways PNG is less visually attractive and coming here involves higher risk for the traveler. “Last year my company made arrangements for a wealthy resort developer from Brazil to fly down to an uninhabited island in Milne Bay where he wanted to build a luxury getaway resort. “But when he arrived in Port Moresby he took one look at Jackson's Airport terminal and said ‘cancel the trip to the island, there's no way I can bring my guests through this grubby looking airport with people spitting red stuff everywhere’. “And he turned around and left on the next flight out. If the Papua New Guinea tourism industry is smart it will not try to compete in the mass tourism market but will focus on offering "niche" (specialised) tourism products that appeal to travellers with specific interests, including scuba diving, surfing, fishing and even unusual interests like volcano climbing and collecting beetles. Travellers with special interests tend to stay longer and spend more. “For example, my tour company Ecotourism Melanesia gets a steady stream of cultural tourists interested in ‘primitive’ cultures,” Hayes says. “Many of them live in Europe and North America, they are often very wealthy and they spend two or three months every year travelling the world visiting different cultures. “They read National Geographic magazine and International Travel News and they subscribe to websites like http://www.responsibletravel.com/ . “They have visited many countries already and are looking for somewhere new and different to experience so they come to PNG. “These visitors often stay three to four weeks in the country and visit four or five different destinations and do outdoor activities like hiking from village to village to meet the people and really experience the country. “They often spend K10,000 to K15,000 per head on the ground while in the country and a lot of this money goes straight into the pockets of local people that my company pays to provide guest house accommodation, village tours, village singsing entertainment, dinghy and road transport, access to special sites and trekking guide services. “These ‘high-yield’ tourists also spend a lot on local souvenirs like tapa cloth, carvings, shells and paintings that they like to take home with them. “Compare this with the average beach-and-palm-tree tourist from Australia who goes to Fiji or Vanuatu for five nights. “This tourist on average spends less than K5000 in the country, and most of that goes into the resort owner's pocket with only a little filtering through to the salaries of the local staff working there. Although the overall economic benefit from ecotourism is not as high as mass tourism, local communities get a greater proportion of the money that is spent by ecotourists compared to resort tourists. If Papua New Guinea could be marketed world-wide as an ecotourism destination offering the best ecotourism experiences in the world such as village-to-village trekking, bird watching and encounters with traditional cultures, we could attract more of these high-yield ecotourists which would better satisfy the needs of all the empty village guest houses all over PNG. Over the past 10 years, hundreds and hundreds of village guest houses have popped up all over Papua New Guinea but most of them have not had any guests yet, or have only had a few. “Every week my company receives letters and faxes from village guest house owners asking us to send tourists to their guest houses,” Hayes says. “As we are only one small company we cannot possibly supply enough tourists to meet the demand from all of PNG's village guest houses. “This demand will only be met when the number of ecotourists visiting PNG increases and when more tour companies start selling ecotourism as a tour product. “The main impediment to the growth of ecotourism is the lack of targetted marketing. “We need to reach the type of travellers interested in ecotourism experiences in ‘frontier’ countries like PNG. “We need to advertise PNG in places where these types of travellers are likely to see the advertising such in nature magazines and on travel-related websites. “Ecotourists tend to do a lot of research on the internet when planning their trips but PNG is not advertised on the internet enough, we are still spending too much money on sending tourism officials to travel agent trade shows overseas instead of advertising on the internet where we can get 1000 times the exposure for a fraction of the price. “I think some tourism officials are hooked on overseas trips and that is why they are resistant to refocusing on web-based marketing. “At the moment only a couple of private tourism operators are spending money advertising PNG on major information sites like Google and Yahoo! while the government is spending nothing. “Even the main PNG tourism website is not helping us very much; the site needs a complete make-over to make it more attractive and user-friendly. “At the moment the first thing you see when you log on to the PNG tourism web portal is a guy with teeth stained black by betel nut... what a turn-off, somebody is not thinking right. “The lack of marketing is also a problem in village tourism training workshops which are held around the country. “These workshops focus on how to build and operate a guest house but do not provide enough training in how to market it and manage it profitably. “Village people get excited and run back to their village and build a guest house and then sit in their empty guest house waiting for tourists to appear by magic. “Tourism officials keep saying we have to do the awareness and the training before we can do the marketing otherwise if tourists come and we are not prepared for them they will not have a good time and they will never come back. “I've never met an ecotourist who didn't have a good time in PNG, no matter what goes wrong ecotourists are always thrilled with the experience of visiting this country and always very forgiving for any problems because they understand PNG is a frontier country with a less-developed tourism industry. “They like it like that... if everything in PNG were developed it wouldn't be attractive to ecotourists any more. “Too much tourism training is done by officers from NGOs and government organisations that don't actually run tourism businesses themselves, they are all theorists. “And when they do cover marketing it's all theoretical gobbledygook without any hands-on skills training on how to design a pamphlet or how to work out the price to charge for a day trip for a group of visitors, or whatever. “Tourism trainers keep referring to village-based tourism as ‘projects’ - they're not projects, they are business ventures and they have to be marketed and operated so that they will make a profit, that's what it's all about. The old Lae airport has played a significant role in the history of the town, Papua New Guinea, and the whole world for that matter. Mordern day Lae and PNG grew because of the airport. The greatest airlift the world had ever known started from Lae to the Bulolo goldfields in the 1930s. World attention was focused on Lae in 1937, and continues to this day, when it was the last port of called for the famed American aviatrix Amelia Earhart before she disappeared somewhere over the deep-blue South Pacific ocean. Lae airstrip was bombed out by the Japanese on January 21, 1942, however, recovered to become a major player in the development of post-war PNG. I still have unforgettable memories – as a child - of flying to Wewak, Rabaul, Buka, Kavieng, Goroka and many other places in those trusty old Ansett, TAA and later Air Niugini DC3s and F27s. The old Lae airport started losing its thunder in 1977 when Nadzab, an American World War 11 strip, became operational. Fierce political squabbling over the pros and cons of Lae and Nadzab continued until 1982, when, in an unsolved mystery (just like Amelia Earhhart), the Lae airport terminal was burned down. Nadzab had taken away its glory; however, Lae continued to be used by Air Niugini and other third-level airlines until 1987. Lae continued to be used as the base for the PNG Defence Force Air Transport Squadron until it was transferred to Port Moresby in 1992. After that, one of the greatest icons of PNG history was literally left to the dogs, and became covered by bushes. It was only recently that the land was sub-divided for commercial purposes as well as given back to the traditional landowners. The story of the old Lae airport is a fascinating one, and is well-documented in the book Lae: Village and City, written by pioneer University of Technology lecturer Ian Willis. The discovery of gold at Edie Creek above Wau in 1926 sparked off a gold rush which led to the exploitation of the rich deposits of the Bulolo-Watut river system by large-scale mechanised mining. The rigours and cost of the eight-day walk into the goldfields and the difficulty of building a road from the coast led to the early introduc­tion of an aviation service. The driving force behind the develop­ment of the goldfields was Cecil J. Levien, a former Morobe District Officer who has been described as a “rare and formidable combina­tion of opportunist, practical man and visionary”. Levien persuaded the directors of Guinea Gold N.L. that startling profits would be made by any aviation company that could provide a service to eliminate the arduous walk between Salamaua and Wau. He secured an option on a small DH-37 plane in Melbourne and engaged a pilot, E. A. “Pard” Mustar, to bring it to New Guinea. He then selected Lae as the best place for the coastal airstrip and without bothering to obtain official permission, took on about 250 labourers to clear and level a landing ground under the supervision of Tommy Wright, the foreman of the agricultural station. The construction of the airfield was perhaps the biggest enterprise ever undertaken at Lae and greatly perturbed the local villagers, who watched amazed as a vast area of bush was torn down and gardens were flattened. They were in for further surprises when Mustar and his mechanic, A. W. D. Mullins, flew in from Rabaul, where they had been assembling and testing the plane. Their arrival brought the full power of Western technology home to the villagers with a shock. The mastery of Europeans, previously seen in their goods and possessions, was now indisputable. The aviation service was a success from the start. After two unsuccessful flights around the mountains south of the Markham ­no one knew exactly how to find Wau from the air. Mustar landed at Wau for the first time on 16 April. 27, 000 lbs of cargo in the first three months. Rival aviation companies were not long in arriving to share the profits. Ray Parer, the proprietor of Bulolo Goldfields Air Service who had been com­peting keenly with Mustar to be the first to land at Lae, came from Rabaul after many delays, and A. “Jerry” Pentland and P. “Skip” Moody soon joined them. Guinea Airways (the aviation company that grew from Guinea Gold N.L.) had acquired two extra planes and was employing three further pilots and two more mechanics. Then in March 1929 a new company, Morlae Air­lines, began a weekly Lae-Port Moresby run, meeting ships from Australia and bringing passengers and frozen foods across to Wau, Bulolo, Salamaua and Lae. This service cut the time needed to get from Port Moresby to the goldfields from six days to one. The town developed quickly as the volume of traffic increased. What had been a rough clearing in the bush in early 1927 soon acquired workshops, hangars, storage sheds, offices, houses and bar­racks. At first the growth was unsupervised and chaotic. Guinea Gold N.L. had built the airstrip without permission and had no power to prevent other operators from using the land or erecting buildings. As a result early Lae grew as a large European squatter camp. Each new arrival simply set himself up wherever he pleased without concern for ownership. Levien in particular was concerned at the uncontrolled building, which he believed was becoming a hazard to aircraft. No one was sure who owned the land, but that the local villagers may have had rightful claims does not seem to have been considered. The question of ownership was finally settled in favour of the administration. The government, with might on its side, ended the squabbling between the various contenders by resuming a large area including the airstrip in August 1927. Earlier the land had been put up for sale by tender by the Custodian of Expropriated Properties, who had control of it because it was the property that had been expropriated from the Neu Guinea Compagnie. The administration had been a tenderer, but concerned that it might be outbid by an ambitious, go-getting company like Guinea Gold N.L., it withdrew its tender and resumed the land instead. The government took a huge slice-the entire 11721 acres of the Compagnie's holding­ stating that it needed the land for an aerodrome, a shipping depot, an agricultural station, and native reserves. Those wanting to build now had to arrange a lease with the government. The administration was strongly influenced by an officer of the Department of Civil Aviation, W. J. Duncan, who had been seconded by the Australian government to the New Guinea administration to report on and supervise the founding of aviation services in New Guinea. Dun­can's report, which he submitted in late 1927, recommended that the administration should take responsibility for airport construction and maintenance, that it should sub-divide the area around the airstrip into a series of blocks, each three chains wide and five chains long with a roadway between them and lease each for £20 a year. Lae thus became the prototype for New Guinean towns built around airstrips. In such places the airstrip dominates the shape and form of the town, usually occupying the central position. (Later air­port towns were Goroka, Mount Hagen, Kainantu and most sub­district headquarters opened since World War I1). The airstrip in New Guinea is perhaps analogous to the railway station of an earlier era in America and Australia, because it has generally decided the shape and the settlement pattern of the town. In early Lae this was obvious: the workshops and hangars clustered between the end of the airstrip and the wharf, the Europeans lived to the east of the strip, near the river terrace, while the New Guinean labourers generally lived on the far or western side. An important impetus to the growth of Lae was the decision of the gold mining interests to airlift in sections the heavy mining machinery they used for treating the Bulolo and Watut River gravels. At first Bulolo Gold Dredging Ltd and its parent company, Placer Development Ltd, had thought of building a road to the goldfields, but the length of time it would take and the high cost of construction and maintenance persuaded the companies to accept Guinea Air­ways' proposition that “skyways are the cheapest highways”. On the advice of Mustar, Bulolo Gold Dredging purchased three all-metal, tri-motored Junkers G-31 aircraft from Germany, which Guinea Airways was to operate under licence for the gold mining company. Guinea Airways also purchased a Junkers G-31 of its own. They were huge planes, each capable of carrying a payload of 7100 lbs or 14 short tons together. The airlift began in April 1931 and continued for eight years: the first dredge began work in March 1932, the eighth in November, 1939. It proceeded smoothly because of the spirit of co-operation existing between Bulolo Gold Dredging and Guinea Airways, and because of their streamlined operation. At Lae they had a wharf 75 feet long, with half a mile of railway running around the foreshore to the storage sheds at the airport. Because of the unsatisfactory harbour facilities at Lae-unstable foreshore, open anchorage and steeply sloping seafloor-all cargo had to be lightened ashore in barges, which were then unloaded by steam crane. Another crane at the airstrip lifted the heavy machinery into the planes and a rail crane unloaded them at Bulolo. Eventually operations became so efficient that nine round trips a day were possible. The airlift was a remarkable undertaking. It pioneered the use of aviation in the transport of heavy cargo and, in the words of one writer, “in every respect it constituted a world record”. While it lasted the power of Western technology was daily impressed on the local people, who stood by bemused as the town grew around them. The airlift stimulated the steady development of the town and by 1942, when it was destroyed by Japanese bombing, it had about 120 European residents, about sixty Chinese and perhaps several hundred New Guineans. It became a bustling, busy place, and though it remained chiefly a centre of the aviation industry, it developed a distinctive town life of its own. “Lae is now a township ranking high in the Mandated Territory of New Guinea. It is a centre of great activity . . . and one of the biggest (if not the biggest) aircraft centres in the southern hemi­sphere. The European population is now around the hundred mark and is increasing with each steamer. Accommodation is being taxed; so much so that a new hotel has been commenced and is expected to be completed in a month or two." A death that momentarily focused world attention on Lae was that of the American aviatrix, Amelia Earhart Putnam, who vanished with her navigator, Fred Noonan, after leaving Lae in June 1937 on the longest leg of their trip around the world. Old Lae residents used to recall entertaining the couple in the Hotel Cecil the night before their departure, and then seeing them off the next morning. Their plane was so overloaded with its eight tons of fuel that it was still barely clearing the waves as it disappeared from sight, flying east along the Huon Gulf coast on its way to Howland Island 2600 miles to the north. On such occasions Laeites, regardless of class or social position, felt they were part of history.